I have always been surrounded by books. 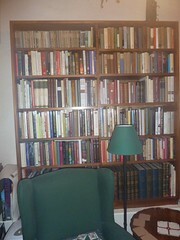 According to my parents no room was complete without a bookcase full of bindings in all shapes, colours and sizes. Although It was clear that it would never be possible to absorb the words in each and every one of them, my father continued to buy more. Rather than pile up books untidily a proper place would be found for each one, and when the bookcase groaned with the weight, another bookcase would be bought or built. When the house was full there was nothing for it but to buy a bigger house. My father loved giving me books to read. I would often ask ‘what should I read next?’ and he would hurry up the stairs and pull out a book and place it my sticky hands. 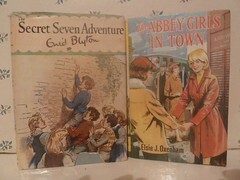 As my bookshelves were mainly full of Jill's Pony Club and What Katy Did I was always slightly bewildered to be given a book without a colour picture on the front of a schoolgirl or a furry animal. He always assured me that I shouldn't judge a book by its cover, and I would dutifully read all the books he gave me. Generally he would give me science-fiction or horror, not genres that many Sindy-doll obsessed young teens read. 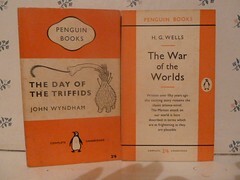 I dutifully read ‘The Day of the Triffids’, ‘War of the Worlds’ and ‘Best Ghost Stories’ by MR James, but was perhaps always a little grateful to get back to the books I knew best with brightly-coloured covers. I was always conscious too that the book must be returned without a smudge or, God forbid, a corner folded over to mark a page. It was an unwritten rule in our household that books were precious objects and a creased binding would not go unnoticed. My father often partook in our reading habits too though. My sister and I subscribed to Bunty and Judy and we would often select a story for him to follow. In between working on highly important safety cases for the running of our country’s nuclear power stations (his day job) he read through about 10 years of ‘The Four Marys’ and their school ground antics. Although not as long running, the most memorable story I selected for him was ‘Before the Light Goes’. Set in Victorian England it told the sorry tale of a young seamstress who, owing to the fact that she can’t afford to buy candles, has to stitch in the dark and eventually succumbs to blindness. 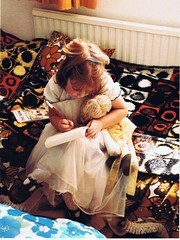 Neither of us will forget the unhappy day when the story finally ended, and the young seamstress drew her final breath. Although I always felt slightly guilty to be reading comics (I hate to admit that I subscribed to Judy until well into my teens when most kids my age were reading ‘Just 17’ and ‘Smash Hits’), my father reassured me that it didn’t matter what I read, so long as I read. I still think of this now when I pick up a John Grisham on a train journey. Next Installment: What to read on a train.